Yes, you can kick off the new year with a boost to your happiness! Research shows that when we plan ahead, we are more likely to use ALL of our time off, take MORE vacation days at once, and report increased levels of happiness at work and at home. Celebrate National Plan For Vacation Day on January 29, 2019, by plotting out your travels. What are you waiting for? It’s time to TAKE BACK your calendar and put vacation at the top of your priority list. Compass & Key is here to help you lay the groundwork for your 2019 adventures with this fantastic vacation planning tool, courtesy of our friends at Project: Time Off. Even if you don’t know where you’re traveling yet, just set aside the time. Then coordinate your plans with family and friends, and share with your colleagues in advance. All from this planning tool! Planning ahead helps you avoid being part of the 52% of U.S. employees who left vacation days unused in 2017. 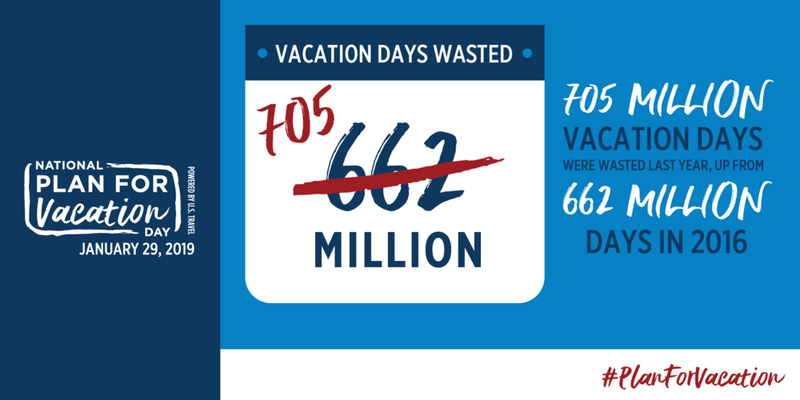 This year, don’t let your vacation days be part of a statistic. Put the fear of missing out behind you and turn your bucket list into a to-do list by starting to plan now! Read more about the importance of planning at ProjectTimeOff.com/Plan-Your-Days.